Do you wish you could close your eyes and the Trump presidency would just go away? ... Behold the next best thing. It's another time, another place. Welcome to the Trumpassic Period. They're all here. The Tyrumposaurus, the Crookadillary and the rest of the not quite ready for prime time dinos. Read along as they traipse through the Puhl-DePlugg Reservoir, where politics meets paleontology in dozens of delicious dinosaur tales guaranteed to turn that frown upside down. 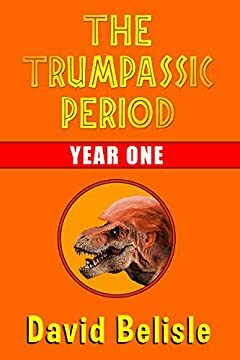 See Trump's White House news through a dinosaur lens in the first year of this unforgettable farce.